While quite cheap, the Life One duo can be outside your price range. Then there's the BLU Studio X and Studio X Plus. Those two also come in 5" and 5.5" options, but go back to a MediaTek chipset and 3G connectivity in return for lower price tags - $130 and $150 respectively. Internet speeds may top out at 21Mbps, but the Studios bring a second SIM slot over the Life Ones. Surprisingly, the chipset change doesn't stop the duo from expecting an update to Android 5.0 Lollipop. Makes you wonder why the fancier Vivo Air is getting left out. Anyway, the rest of the Studio X specs are similar if slightly downgraded to the Life One. This includes a 720p IPS display, an 8MP/1080p main camera and 2MP selfie camera, thicker bodies (10.5-10.6mm) and no Sandstone color option. The batteries also take a hit and are 2,100mAh for the 5" model and 2,600mAh for the 5.5" model. That's despite being thicker than their Life One counterparts. Honestly, we're not completely sold on the $50/$30 saving considering the BLU Studio X and Studio X Plus downgrades are not trivial. While the US market is not very budget-focused, the BLU Studio G slips under the $100 line for those who never splurge on a smartphone. Its price point leads to some heavy cuts to functionality, but a future Android 5.0 Lollipop update and 5MP/720p camera put it in good standing against the likes of the Microsoft Lumia 535. The two have similar screens and chipsets - a 5" 480 x 854px (196ppi) and a quad-core Cortex-A7 with 512MB RAM for the Studio G.
Admittedly, Windows Phone runs better on this hardware than Android does and it doesn't help that there's only 4GB of built-in storage. Those 720p videos are going to fill up the storage quick, so you absolutely need to pay extra for a microSD card. The BLU Studio G is a dual-SIM phone, so it can make a cheapo travel phone with a local SIM next to your regular card. A more compact alternative is the BLU Studio C Mini - it has a 4.7" IPS screen with 480 x 800px resolution and is a dual-SIM like the Studio G. This one runs Android 4.4 KitKat and there's no word on a Lollipop update. Currently, the Studio C Mini is $95 on Amazon, so saving a few millimeters here and there may be hard to justify. The BLU Studio C HD has a much sharper screen - 5" big and with 720p resolution. It also has 1GB of RAM. We know KitKat (and Lollipop too) are optimized to run on 512MB, but meeting the minimum requirement doesn't mean it runs great. 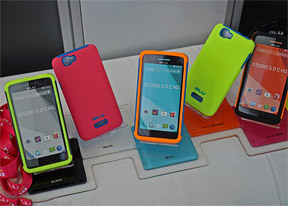 All BLU Studio handsets come in a variety of bright colors, from the low-end G and C to the higher-up Studio X.